Taneisha White, ’17, had a high school dream of playing professional basketball overseas, but when that dream was no longer a reality, she looked for a backup plan. That plan was to become the CEO of her own company. Lacking the experience, education, and confidence needed to manage a business, White feared that she would fail, but her family’s encouragement led her to pursue an MBA. 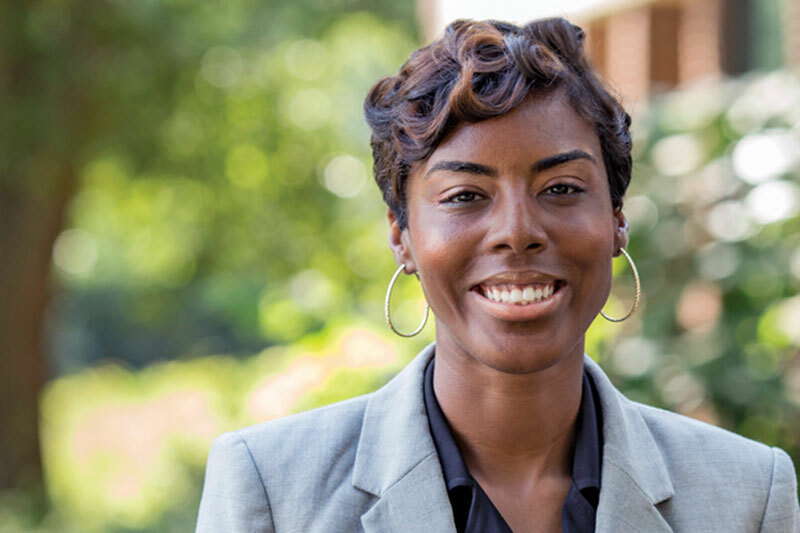 In August 2014, she attended an information session at Meredith College, and at the conclusion of that session she knew Meredith was a perfect fit. White was sold on the comparable tuition cost, the relatively small class sizes, and the passionate testimonials from Meredith MBA alumnae. She wanted to experience the same transformation and growth that those alumnae had shared. Being a college basketball player at Winston-Salem State University, White believed her only strength was in her sport. On August 23, 2015, life became clearer for her after she took the StrengthsFinder 2.0 survey as part of the StrongPoints® program and discovered her top five strengths: developer, positivity, learner, belief, and relator. She always discounted those gifts, but now, she is going to use them to impact the world. The Meredith MBA program has given White confidence, competence, and courage to go after what she wants in life. That confidence helped her apply for her current internship. White started an internship in July 2016 with the Environmental Protection Agency (EPA), where she serves as a financial technician. Through this experience, she has learned the importance of corporate social responsibility and the role that she must play in creating change in the community. In the summer of 2018, her dream of being the CEO of her own company will come true when she launches the Heart Academy, a nonprofit business academy with the purpose of developing minority youth into strong individuals, spiritually, mentally, physically, and emotionally. The students will learn what their gifts are, discover how to identify their gifts, and how to implement those gifts in their everyday lives as Meredith does for its students. In December 2017, White will graduate from Meredith with a master’s degree in business administration. Learn more about the Meredith MBA program. Find out how StrongPoints® makes every student even stronger.